For ‘Open house weekend’ many buildings across London, normally private spaces, open their doors to the public. Saturday 22 September 2018 we visited the Foreign and Commonwealth Office; the Banqueting Hall, Whitehall; the Royal Society (which includes the former German ‘third reich’ embassy); and the Reform club, Pall Mall (it is filled with books and comfy chairs, and photographs are not allowed). I am privileged to have had an art school education at the (then) London College of Printing (LCP) with typography tutors including Brian Grimbly and Anthony Froschaug. Recently I was interested to discover the First things first manifesto from just over fifty years ago, they are two of the 22 who signed it. A pretty good description of the LCP course where, much later, I was their student – BA (honours) Media Production Design. The Eden project, Cornwall is a place we have always wanted to visit, and we have been in the near vicinity most summers over the last ten years. In the end it was just Deirdre, Harvey and myself who visited on a day of sunshine and showers. Dogs are allowed in the grounds but not into Sir Nicholas Grimshaw’s marvellous biomes, which are the main attraction, so we had to take turns to go in or to mind our boy. The grounds are beautifully planted, and when Deirdre was in the biomes, I was able to see most of the hillside gardens while being pulled in all directions by Harvey. Click on any image below to see all of the photos enlarged as a slide show. I really like Lato – the font I am using here for my website. A humanist Sans very much in the mould of Monotype’s Gill or New Johnston but with all the niceties required of a font these days. A good range of weights (nine!) and ligatures, added to recently with a variety of glyphs, and it’s FREE – made available for print and web by the tyPoland foundry and by Google fonts. The designer himself, Łukasz Dziedzic of tyPoland seems to be quite a character too, describing Lato as “Male and female, serious but friendly. With the feeling of the Summer”. 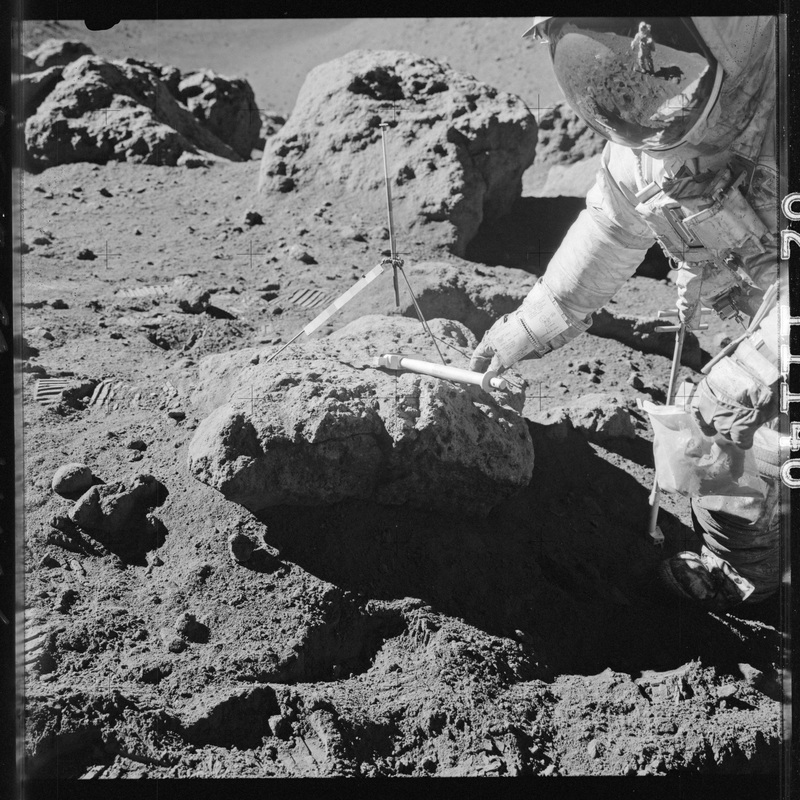 NASA has released a quite enormous number of high resolution images from the Apollo program into the public domain with the promise of more to come. The Project Apollo Archive, this picture of David Scott and James Irwin from the Apollo 15 mission, all images are labeled with each film roll number from their Hasselblads and 35mm cameras. Wow! Network at the Royal National Theatre – what an incredible night / event / experience / play / performance / live cinema / multi-visual set / meal / cocktails. Thank you Missus. Photos were taken before the action, treading the boards, but we were at the bar on stage the whole night. The play went on all around us, performers – including the star Bryan Cranston – often just a few feet away. Play, food, everything, based on the ’70s but given a contemporary twist and all quite extraordinary. The run ends soon, Foodwork restaurant fully-booked I think, but do go see it if you can. And here’s what the Guardian food critic had to say (spoiler alert). Question of the day: did Elon Musk commission Pacman as his SpaceX capsule and suit designer? We have been regular participants at the Clock House pub quiz on Tuesdays, but alas, it is to be no more. A change in management combined with a new marketing plan has no room for us quizzers from October. Thank you Simon for being our QM for the majority of weeks these last few years. A selection of photos (mainly taken by Simon) of the Question One Quiz include our recent victories. We will be seeking a quiz elsewhere, do you know a good one in the SE22 area?